Garlic: A Natural Cholesterol Lowering Herb & One of the Best Cholesterol Treatment Alternatives. Garlic (Allium Sativum) is the world 's best example of a medicinal food and a common part of popular heart health recipes. It's also one of the most intensively studies herbs in the natural medicine today. Garlic and cholesterol are the two words that have been used together extensively. Clinical studies have shown the Garlic can help lower the risk of atherosclerosis, a hardening and narrowing of the arteries, and also lower blood pressure thus preventing heart attack and stroke. Garlic contains sulfur-based compounds known as allyl sulfides and other phytochemicals that studies show may help lower cholesterol naturally. It may also raise HDL cholesterol to improve the ratio of beneficial & healthful high-density lipoproteins cholesterol to LDL (harmful) cholesterol (cholesterol hdl ldl ratio). Garlic appears to directly inhibit production of cholesterol by the liver and to enhance the excretion of cholesterol. Garlic extract is featured in Natural Assets' CholestMIN (a cholesterol lowering complex). Click here for more information. F. Gilbert McMahon, MD, and other researchers found a reduction of both cholesterol and LDL cholesterol in 12 weeks with 900 mg/day of powdered garlic or equivalent of 1 1/2 cloves of garlic or less than 1 softgel of garlic oil concentrate 500:1 (equivalent of 1500mg of garlic). Researchers at Memorial Hospital of Rhode Island in Pawtucket found that supplementation with aged garlic extract have beneficial effects on the lipid profile and blood pressure in people with moderately high levels of cholesterol. LDL cholesterol dropped by 4.6 percent in the treatment group when compared to the controls and there was also a 5.5 percent decrease in systolic (beating) blood pressure. Dr Khalid Rhaman and colleagues from a nutraceutical research group at Liverpool John Moores University in the United Kingdom have previously demonstrated in a clinical trial that a daily supplement of aged garlic extract inhibits platelet aggregation in healthy people. The group also said that the supplement could significantly reduce the chances of heart attacks in heart patients by reducing the chances of blood clots forming. Garlic extract is featured in Natural Assets' CholestMIN (a natural cholesterol control product). Click here for more information. Garlic is an antioxidant that helps to prevent the oxidation of blood fats, a major cause of atherosclerosis and other heart disease. Laboratory experiments have demonstrated that garlic has powerful effects against various disease-causing microbes, including bacteria, viruses, and fungi. One of the most exiting areas in garlic research involves its potential cancer preventive properties. At a meeting of the American Institute for Cancer Research help September 2-3, 1999, in Washington D.C, Lenore Arab Kohlmeier, Ph.D, reviewed the literature from 1966 and present an analysis of 19 case studies. There was strong evidence of garlic's effectiveness in reducing the risk and occurrence of various cancers, especially stomach and colorectal cancers. Researchers at the University of Exeter in the United Kingdom suggested that Allium vegetables (garlic & onion) have a protective effect, especially on gastrointestinal tract cancers. The antibacterial and antimutagenic effects of garlic are probably the reason for its beneficial effects against cancer. 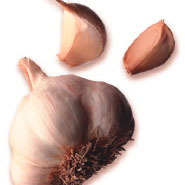 Garlic is also featured in Natural Assets' AbsoGreens (an antioxidant/anti aging supplement). Click here for more information. Steiner, Manfred, et al., "A Double Blind Crossover Study in Moderately Hypercholesterolemic Men that compared the Effect of Aged Garlic Extract and Placebo Administration on Blood Lipids"
"Cholesterol, Blood Pressure, and Garlic," Nutrition Week 27(20): 7, May 23, 1997.